Disengagement in workplace learning costs organizations much. When learners are disengaged with learning, organizations have a direct impact in the form of higher dropout rates, lower productivity, absenteeism, attrition, safety incidents, data privacy issues, and more. Lack of direct interaction and flexibility in courses, their inability to cater to different learning styles, the declining attention spans of employees and other factors cause disengagement in online learning. So, how do you increase learner engagement in your online courses? There are many ways to engage your learners, but let’s confine this blog to leveraging Articulate Storyline to build engaging online courses. Lack of direct interaction with the instructor and fellow learners is an obvious and most genuine reason for disengagement in online courses. How Articulate can be used: You can develop a number of interactivities using Articulate Storyline and generate the much needed interaction and involvement in online courses. 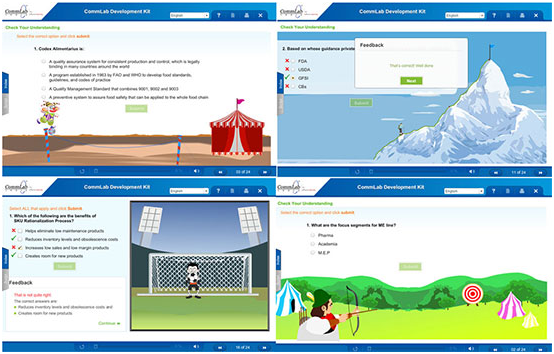 Storyline supports interactivities to teach and to assess. You have at least ten interactions to teach and nine interactions to assess. Not only that, you can customize them in a number of ways, according to your training need. 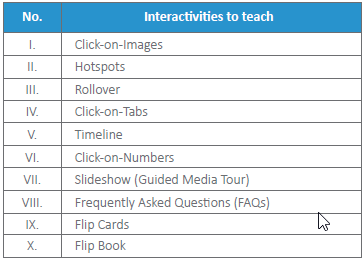 Interactivities to teach: Click-on-images, click-on-numbers, hotspots, rollovers, click-on-tabs, timeline, slideshow, FAQs, flip book, flip cards, and more. 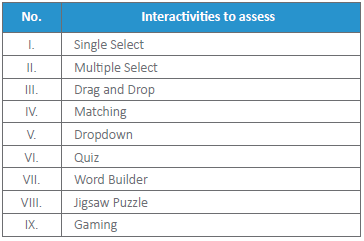 Interactivities to assess: Single select, multiple select, drag and drop, matching, dropdown, quiz, word builder, puzzles, games, and more. Including group activities within an online course will promote collaborative learning. For example, learners can participate in discussions, comment on peer-generated content, read blogs, or do a project collectively. You can’t teach your blue and white-collared workers the same way. Many instructional designers are unsure of how to present their learning content in online courses, and that’s where learner disengagement seeps in. They don’t use the right instructional strategy as per their training requirements and learner preferences. How Articulate can be used: Articulate Storyline supports many instructional design strategies. Developing an online course with the ‘guided learning’ strategy with animated characters is easier than you think, in Storyline. This strategy fills the gap of an instructor virtually and gives the feel of individualized instruction. You can develop various scenarios with characters and backgrounds in Articulate Storyline. Scenario-based Learning puts learners in the situation and compels them to take decisions, and also develop critical thinking. You can develop Learning through Exploration and Discovery (LEAD) strategy in Articulate Storyline with relevant settings and clickable elements that can be explored. This provides learners the flexibility to explore and learn new things. Developing game-based learning is also easy with the available features in Storyline. You can add gaming elements such as points, levels, scores, and leaderboards in Articulate Storyline. No learner wants to be controlled. They expect a flexible course structure and the choice to learn what they learn. Linear, restricted navigation in online courses are turn offs for them. How Articulate can be used: Avoid restrictions in navigation and allow them to skip slides/topics, give them the choice to go to the assessments directly – Articulate Storyline allows for a flexible course structure. It’s possible to create different learning paths with branching scenarios in Articulate Storyline, based on the learners chosen options and their interests. This clears the way for self-directed learning. Is it not a crime to rob your learners’ time hours together, in the name of online learning? How can you expect your learners to sit for hours for online learning in the age of disruptive technologies? How Articulate can be used: You can overcome this issue by developing microlearning modules in Articulate Storyline. This helps your learners access bite-sized learning at the moment of need and also in their leisure. Articulate lets you incorporate microlearning assets such as short videos, mini games, infographics, interactive PDFs, how-to demos, quizzes, and more. Articulate’s built-in templates and assets also make developing microlearning easier. When you say microlearning, it should be compatible with multiple devices. You can get responsive and HTML5 output for your online courses in Articulate 360. Heavy text-no visuals, low quality images-machine voice narration, no audio-only text and visuals, these are some improper combinations that can cause learner disengagement. Each learner has a unique learning style – visual, audio, and kinesthetic. Some read well, some prefer watching videos and visual content, some learners prefer listening, and some more people prefer learning by doing. If there is no proper combination of formats in your online learning courses, you can’t cater to various styles of learners. How Articulate can be used: You can create online courses with a proper blend of text, audio, and visual formats, using Articulate Storyline. Developing videos will appeal to visual learners; preparing podcasts for the convenience of auditory learners and designing interactivities, games and other activities for kinesthetic learners, all are possible with Articulate. Modern learners won’t invest their efforts where it’s not worth their while. So learner engagement goes down if there is no proper motivation. They also expect an element of fun and competition in learning. How Articulate can be used: You can leverage Storyline to develop online courses that offer learners the opportunity to compete and give them a sense of achievement by using game elements. You can develop gamified courses using Articulate; you can introduce points, leaderboards, levels and more for fun. This way, you can build friendly competition among learners, so that engagement levels go up. You can also extend these points to appraisals and performance, to make them long term. You also have various publishing options in Articulate Storyline, to make online courses accessible to your learners in different ways. You can publish your courses to the Web, Articulate Online, LMS, and offline. Yes, making learning engaging is a challenging task, when more exciting things are just a click away. But, it’s not impossible, when you incorporate these ideas using Articulate Storyline. Though engagement is not spontaneous, you can gradually bring it up by providing various learning opportunities and Storyline provides the perfect ways to do so.